...a little bit more healthy! 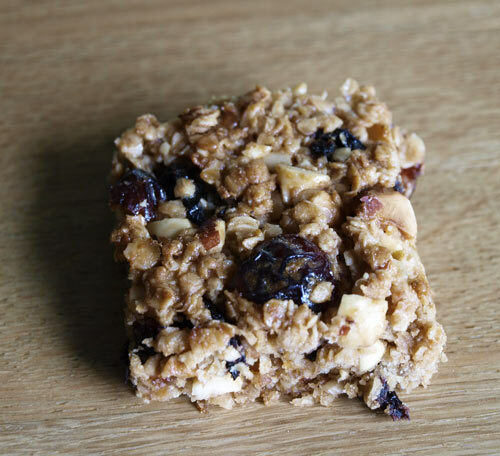 After all that excitement with chocolate (the giveaway will stay at the top of my blog until 20th March when it closes) I thought it would be a good idea to have something around to nibble which, satisfies the need for sweetness but, is still GOOD for YOU. Can there be such a thing, I hear you ask? 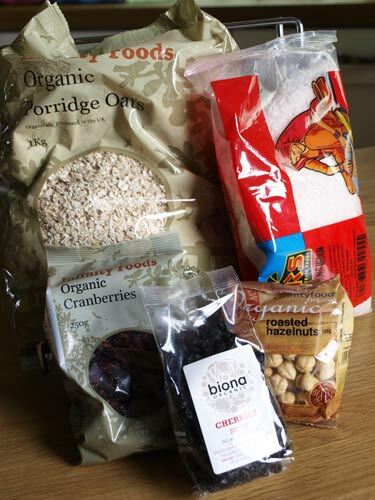 Oh yes, and what makes it even better is that you can get all your supplies online from Healthy Supplies whose strapline is No Nonsense Nutrition! I started by making some flapjacks, I was so impressed by the dried fruit supplied by Healthy Supplies, all organic and probably the best dried cranberries I have tasted, I tried a few as snack, we you have to don't you? The Sour Cherries are a little firmer than the cranberries, a bit like the difference between currants and raisins, so I soaked them for an hour in some orange juice to plump them up a bit. The roasted hazelnuts are also really delicious with a lovely roasted flavour and no fear of burning them (which often happens if I try to roast them myself!). 2. Melt the butter, sugar, honey and peanut butter together in a pan over a medium heat. 3. 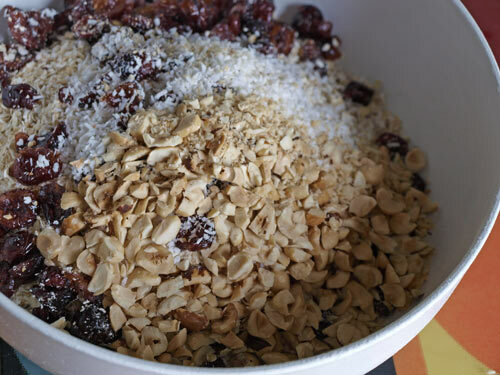 Add the rolled oats, dried fruit, dessicated coconut and hazelnuts and stir well. 4. Pour the flapjack mixture inot a greased 30cm/12in x 20cm/8in square baking tin. Press the mixture into the corners and smooth the top. 5. Place into the oven to bake for 20 minutes, or until golden-brown and bubbling. 6. Remove from the oven and allow to cool. Turn out of the tin and cut into equal-sized squares. 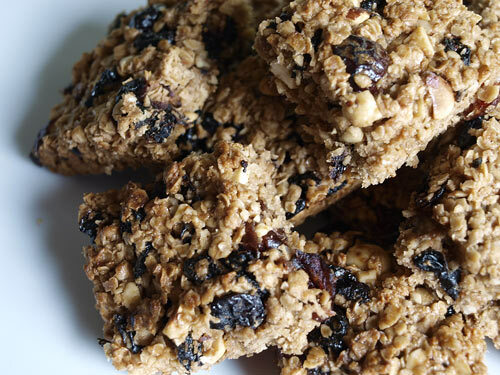 The Flapjacks turned out well, not too sweet with the juicy berries and crunchy hazelnuts adding lots of texture to the bars. I added the peanut butter to help bind the oat mixture together, but if you can't eat peanuts then you could just use another 40g/1oz of butter. I'll be back soon with some muffins made using pretty much the same ingredients. Remember to check out Healthy Supplies, their ingredients are of the highest quality and the service is friendly and efficient. They also stock a lot of interesting and different ingredients for baking that can be difficult to source. Sounds like a possible new breakfast option for me! Love the sound of these, especially the cherries soaked in orange, yum. Flapjack that's good for you, Awesome. Kids, guess what we're doing next weekend ? What a tasty use of these delicious ingredients! Looks really good! Yum! You could totally crumble these and serve them as granola! This looks a lot like my granola recipe. I eat it nearly every day!! Such a timely post. 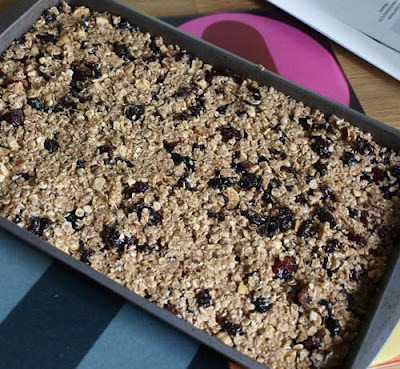 I bought oats at the weekend with the intention of making some healthy flapjacks for Hubby's lunch time treats and never got around to it. I'll be giving these a try. They look so fruity and delicious! Have never used peanut butter in flapjacks before, I have most of the other ingredients in so will have to give them a try! Date and Walnut Scones - A Scone Challenge!